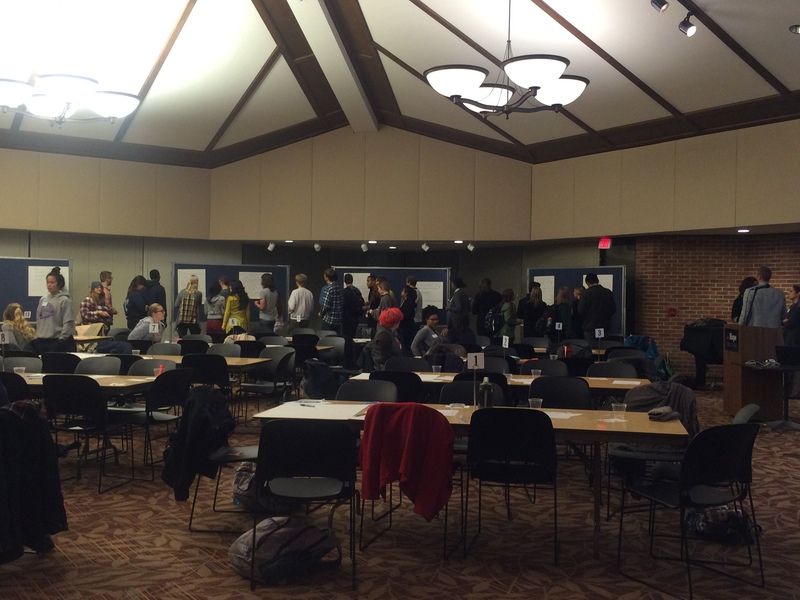 The forum was comprised of thirteen student facilitators (including myself), students in several different courses on race and ethnicity, and members of Hope’s multicultural student organizations (MSOs). Students were asked to respond to three questions. After each question students changed tables, so every facilitator had a new group of students for each question. Between questions, facilitators would hang up their table’s poster with the group’s ideas. Students were then able to vote, using stickers, for their favorite ideas. Question 1: What cultural or procedural practices or policies promote flourishing at Hope? I had a fairly diverse group of students for this question – three Whites, 1 Hispanic, and 1 African international student. They ranged from first-year to senior, and they were all from different classes/MSOs. Students primarily discussed the importance of having open spaces to talk about diversity, religion, and sexuality. They also emphasized that being willing to discuss current events and issues is key. I found it interesting that many students had voted for ideas that mentioned (in some form or another) the many places (such as the Office of Multicultural Education), programs (the Phelps Scholars), and groups (HAPA, BSU, LSO, GRACES) on campus that promote conversations about these topics. Question 2: What cultural or procedural practices or polices impede flourishing at Hope? My second group of students closely matched the demographics of the first group, except this group had African Americans and Asians in it. For this question, students focused primarily on classes. 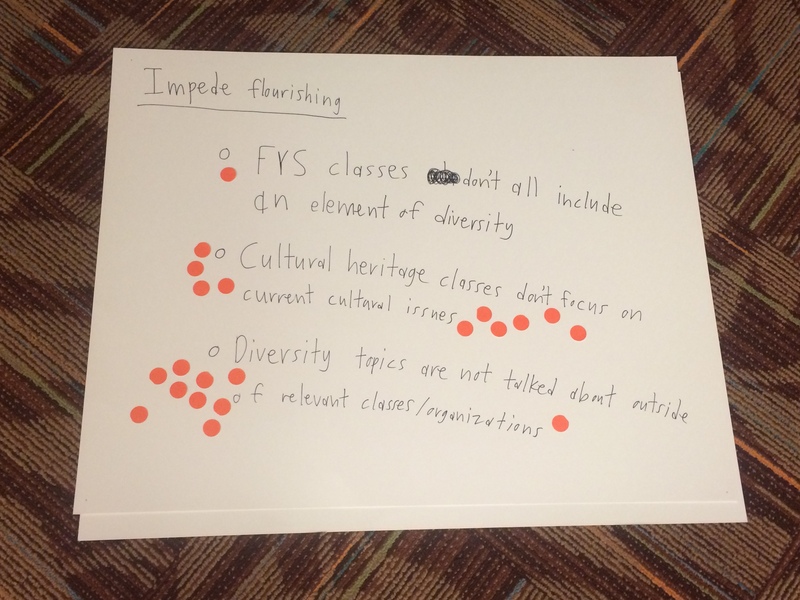 Many of them felt that FYS classes did not include an element of diversity, with the exception of the Phelps Scholars FYS class, and that Cultural Heritage classes did not focus enough on current cultural issues. 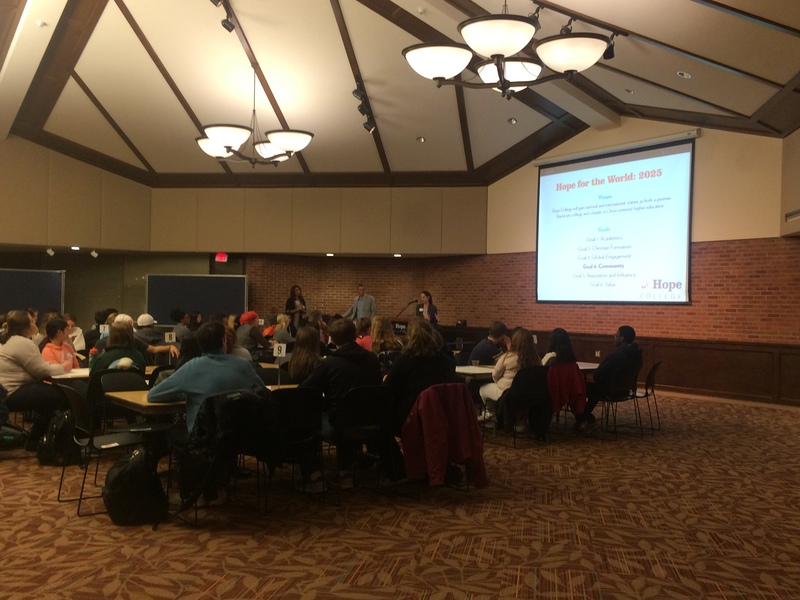 However, the group’s biggest concern was that diversity topics are not discussed on the campus as a whole, outside of classes or organizations specifically focused on the issue. Question 3: What are the three most important and specific steps students, faculty, and campus offices can take in order to promote a culture of flourishing? My third group of students again matched the demographics of the first two, although this one had more Whites in it than the previous ones. Conversation in this group centered around educating first-year students about topics like diversity, culture, and race. Instead of waiting until students choose to take a course about race, why not make a class about race/diversity mandatory in the first year? Students also said that students of different backgrounds should be brought together more often for dialogue. I enjoyed facilitating the discussions at my table, and I feel that everyone had the opportunity to voice his or her opinion. Since the groups were small, all of the students at my table appeared quite comfortable sharing their ideas. Although I expected most of the conversations to be focused on marginalization due to race and cultural diversity, I had one group that discussed the marginalization that arises from having religious beliefs that differ from the majority at Hope, including atheists and Catholics. I also observed that the majority of ideas posted around the room concerned Hope’s structure. For example, changing general education requirements, revising course content, and hiring more diverse professors are all significant structural changes Hope could make. However, there was not much conversation at my table about actions individuals could do to promote flourishing at Hope. Although Hope’s administration is responsible for structurally making Hope a place where all students can flourish, we each can engage in the work of making Hope a college where everyone can flourish. Responsibility falls not only on the administration, but also on Hope’s many students, faculty, and staff. Previous Previous post: Does your church have a Swedish Jesus? Next Next post: When Can Small Steps Lead to Big Results?